After a concert, or a season ends, I always experience a kind of sadness, or emptiness. You leave something behind you, that you have worked so hard for, that have brought struggles and joy, and in the end also brought lovely music to an eager audience. Maybe it is therefore, we have managed to have no more than 44 performances in the 36 months that The Bangalore Men have existed! To avoid post-concert depression! Jokes apart – when we set out on a journey, the 10th of January 2016, with nine guys, I don’t think any of us had in mind that after three years, six of the nine “founding fathers” would still be members of the choir, we would be 17 members, we would have become the first choir in India to achieve distinction in the ABRSM Advanced Level Choral exam, we would have made performances in 10 cities in the country, we would have sung music spanning over 800 years, sung at palaces, churches and concert halls – and actually been in both Indian television and Swedish radio! So, how did we achieve all this? Well, I believe the answer lies in three aspects – the musical leadership, the musical development and the choir as a context. Let’s start by looking at the aspect of musical leadership. What do we mean by this? Basically, that I as a conductor need to realize – that my choir fellas are part of this group as a hobby. This is not their job – they are basically prioritizing the choir over perhaps other activities, work or other commitments. As a leader, it is crucial you are sensitive to this. I always remind the group that a choir is not a bunch of soloists, we only work at our best when everyone is present and everyone know their part – BUT – it is also for me as a leader to understand each and every member’s specific context and life situation, in order to be able to make compromise when required, and challenge when required. Attendance in our choir is high – averaging out on 85% every week over the years – and I believe sensible and sensitive musical leadership is one contributing factor to this. As a choir conductor, my experience is also that you have to invest time in all and every one of your choir fellas, in order to support their musical journey in the best way. It can be anything from offering extra classes, to understanding a challenging personal situation, to recording individual rehearsal files and so on. Every choir member is unique – and every Man in our choir is needed to make us sound at our best. Another important facet of musical leadership is of course also the ability to network and collaborate. We would never have reached where we are today, without a generous attitude towards other musician, a will to explore and collaborate and a humble approach to learning and sharing. The next aspect is the musical development. How to choose the right repertoire? How to make sure that the choir feels motivated and on a continuous path of learning, without choosing too complicated or difficult material? My approach here has been to choose music that is effective – and to lace that repertoire with more challenging pieces. With effective, I basically mean music that is easy on the ear, pretty straightforward and appealing. If you have a base repertoire of this, you can easily add on more complex pieces, which will then be the balancing factor, and make sure that the learning curve continues at every performance. In 2018, nine of our members cleared level 5 in the ABRSM singing syllabus, making the total number of “certified” singers in the choir 14 out of 17. Of course, the exams showcase one aspect of your musical development, in terms of sight singing, aural knowledge and the performance part. Musical development for us also includes trying to become a holistic musician – by not only mugging up scores and parts, but also by trying to understand in which context a certain piece was created, the composer’s life and what influenced him to write the music and of course the general aspect of musicology. I believe that a well-rounded musician needs to always understand not only the music and the words of a specific piece, but also to understand the history, the composer and the times during which the composition was created, in order to do the performance full justice. The third aspect we shall touch upon is that of the choir as a context. I believe that no other instrument makes you so exposed and vulnerable as the voice. The singer’s ability to perform at his or her best is always challenged by mood, weather, illness, stress or other external factors. Therefore, it is crucial to make the choir a “safe” place – without judging, without politics, without any kind of discrimination. I always make a point to aspiring members to mention – we are open to singers of every faith, religion or creed – as long as you are willing to work hard, and stay committed, you are welcome to try out. The choir needs to be something that the members WANT to come to, not a place they feel they HAVE to go to. I believe in creating an open and fun environment, where we all contribute to our collective learning, we all take responsibility and we have fun together. Our rehearsals are always fun-filled, yet focused, and I believe the choir really can provide a place where we are all equal and having a common and shared goal. The Bangalore Men celebrated three years on 10th of January 2019. Our next exciting task are two concerts with The Symphony Orchestra of India, two other choirs from India, a visiting choir from Kazakhstan and soloists from the United Kingdom, where we will perform Beethoven’s 9th Symphony and his Choral Fantasy at the NCPA Mumbai on the 9th and 10th of February. The concerts will be conducted by visiting conductor Martyn Brabbins. Around the corner is also participation in the Ketevan Festival in Goa from 22-24 of February and our own production Vive la France, with music by Poulenc, Fauré, Duruflé and others, which will premiere in Bangalore on the 7th of April. 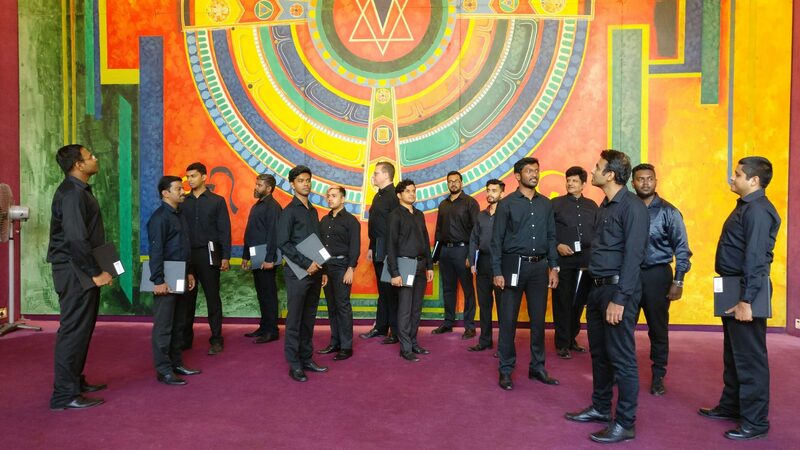 Three years of music – three years of joy – three years with The Bangalore Men! Next ArticleThe Academy of Music, Pune Invites Full Time Teachers | Apply Today!